Cycle-Works recently improved the cycle parking at several sites around The University of Portsmouth, by installing 80 new Josta two-tier racks under modern and stylish Kennet shelters, as part of a larger programme to improve facilities for cycling around the campus. These custom made shelters have an aluminium composite roof and steel frame. 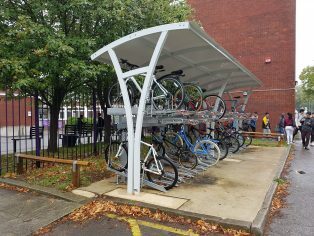 Cycle-Works Ltd supply and install a range of cycle parking products including secure lockers, high capacity solutions, shelters, compounds and racks.